I bless Bus Transportation Magazine for all the wonderful ads they ran through the years that depicted coaches from operators that we were so familiar with. 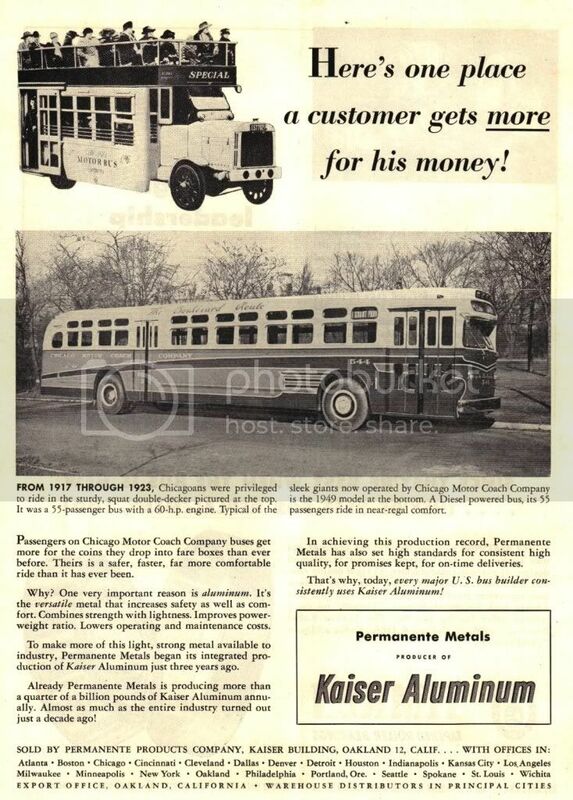 The attachment, from 1949, is no exception and touts Kaiser Aluminum's Permanente Metals products used by all major bus manufacturers and showcases a very special model from Chicago Motor Coach Company. The bus, a 55 passenger 1948 GM Coach Model TDH 5502 and one of one hundred likenesses built exclusively for that Windy City property was, at nearly forty-two feet in length, the longest production transit ever from GM and was slated to replace Chicago's aging and obsolete double decked fleet. Sister company Fifth Avenue Coach had the same idea but New York law at the time prohibited coaches of over 35 feet prompting that company to wait until 1952 for its first 40 footers in the form of TDH 5104's (New York City's extra long 5101's from 1949 were an exception under that municipalities 'home rule' powers). A tidbit of trivia about Chicago's 5502's; (as told to me by either Bill Lawson or Joe Corbin back in the eighties). The fleet numbers assigned to this order were to start at 501 and run to 600 but, through an error on the part of the lettering department at the factory, the first several buses off the line were found to be carrying numbers in the 5000's - a minor mistake that was said not to be uncommon in the days before computerization. In a 1972 GM ad appearing in one of the industry journals, we see the introduction of the lighter duty 'New Look' Model 3302. 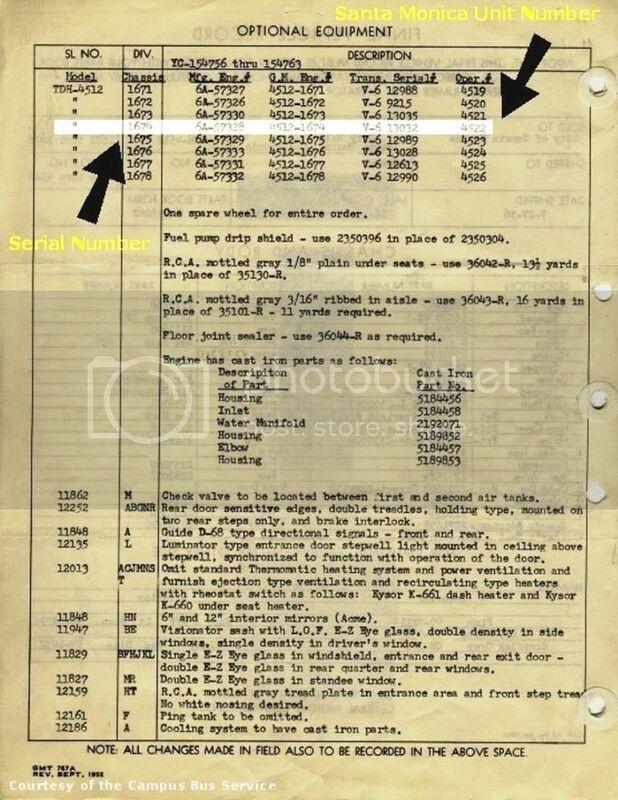 The 3302, the successor to the 3301 line, was unique in that it was every bit as much GM 'New Look' in characteristics, materials, design and reliability as its big brothers - in fact, it was as though the 3302 was a cut down version of a 4500 or 5300. The only difference being that, because of its lighter weight which required less horsepower, these buses were equipped with GM Diesels of a lesser class than the '71' in combination with Allison Torq-matic transmissions not unlike Dual Range Hydra-matics. Only 223 3302's were built between 1972 and 1973 with most going to small properties but some to larger operators for use on less traveled feeder routes and in downtown loop services. Photo courtesy of 4509bus and is up for bid on eBay as item # 350620315328. The photos are copyrighted from Bill Luke & Linda Metler's highly recommended OLD LOOK BUSES / YELLOW COACH AND GM IN THE '40's AND '50's. If you enjoy photos (and text) of old look buses of all sizes and uses, be sure to add this book to your collection. 110 pages of quality photos! Hmmm. A '5502, and then a '3302'. 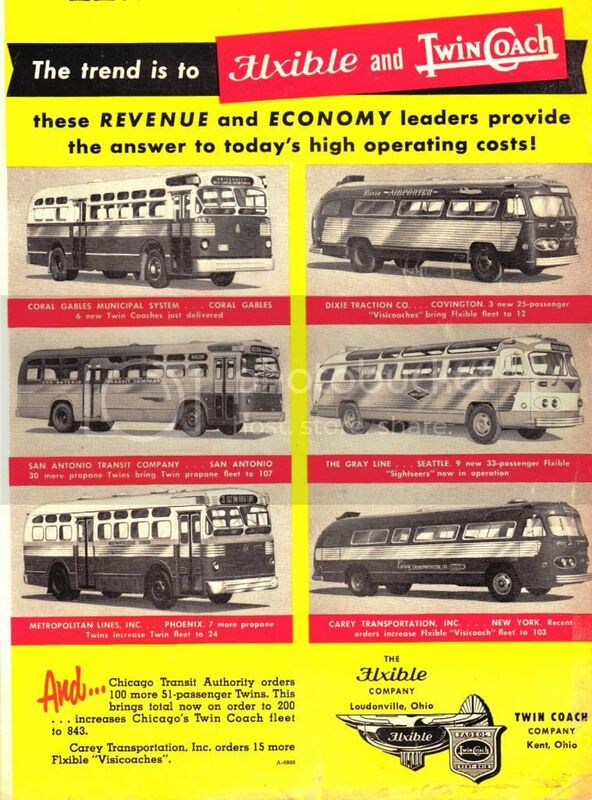 Featured is a 1953 ad from Bus Transportation Magazine (my bible as you know!) touting the latest lines from both Flxible and Twin Coach and showing, as an important customer, a 28 passenger Flxible Airporter (lower right) operating for Carey Transportation, Inc. of New York. I've written much about these buses throughout the pages of BusTalk but will merely reiterate that they were, without doubt, the fastest things on six wheels with their beefed up straight eight Buick 'Fireball' engines. The 1953 order that brought Carey's fleet of Clippers' to 103 was the last from Flxible and was followed shortly thereafter by their first GM PD 4104's which, when it came to speed, were no slouches either! Carey, as the premiere airport connection carrier in New York for years, was a great company that took extraordinarily good care of their customers and equipment - not bad considering that it had its roots as a tonsorial parlor in Grand Central Terminal! Photo courtesy of '4509bus' and is up for auction on eBay as item # 370787541262. 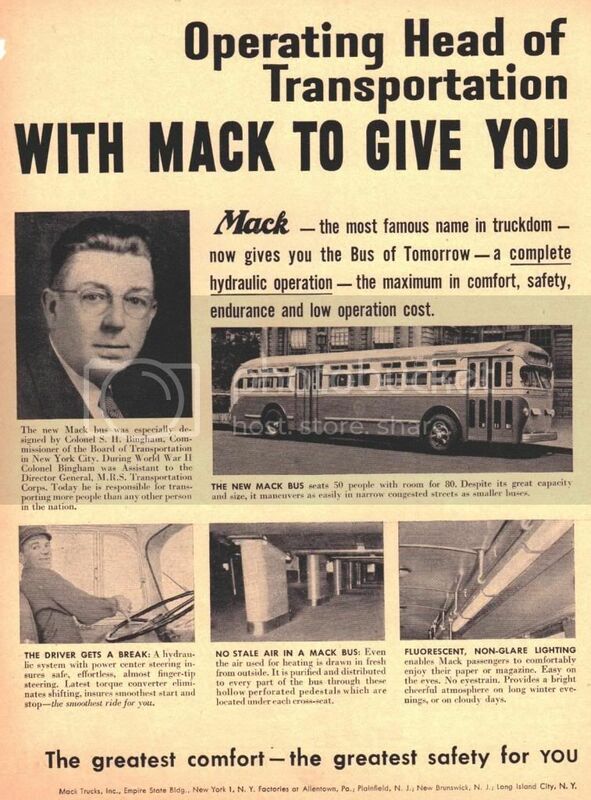 Bus Transportation Magazine (circa 1950) brings us this interesting two page spread introducing Mack's specially designed C-50 series built for the then City of New York Board of Transportation (BofT). 400 of the 49 passenger C-50's numbered 5200 to 5599 hit New York's highways and byways between 1950 and 1951 and, as the brainchild of then BofT Commissioner Col. Sidney H. Bingham (pictured) were commonly referred to as 'Bingham Class Macks'. While the C-50's were solid runners and steered like baby carriages, their immense weight of over 23,000 lbs (the heaviest buses in the city's arsenal at the time) played havoc with their consumption of both fuel and oil. The pictured bus was the original demonstrator and was eventually purchased to replace # 5369 of the fleet which had been destroyed by fire. The cold war was in full swing at the time and the Colonel, an old Army man and being very civil defense minded, thought it to be a good idea to design the C-50's for use as emergency ambulances in the event of attack and incorporated an elaborate system of brackets to accommodate overhead stretchers. Photos courtesy of '4509bus' and are up for adoption on eBay as item # 370803575935. Very interesting details, Mr. 'L'! Traildriver, you are right. The seat in front of you hindered your exit from the window seat! Did anyone get royalties from a patent on this crazy design? I rode these Macks as a kid in Brooklyn and always sat in the window seat next to my Mother. Of course back then, no one really paid attention to the staggered seats. Based on my observations, exiting from the window position was not a problem - people still had "wiggle" space as if the seats were not staggered. I suppose one consolation was being able to look across the aisle without a head blocking the view! The ad gives the impression that all Mack C-50's had staggered seats. Unless someone can tell me, the only property to have these were the NYCTA and of course the Miami examples diverted from the original NY order. Since Civil Defense was a big issue back in the Bingham days, these Macks were ordered to be converted to ambulances as seen in the photos below. 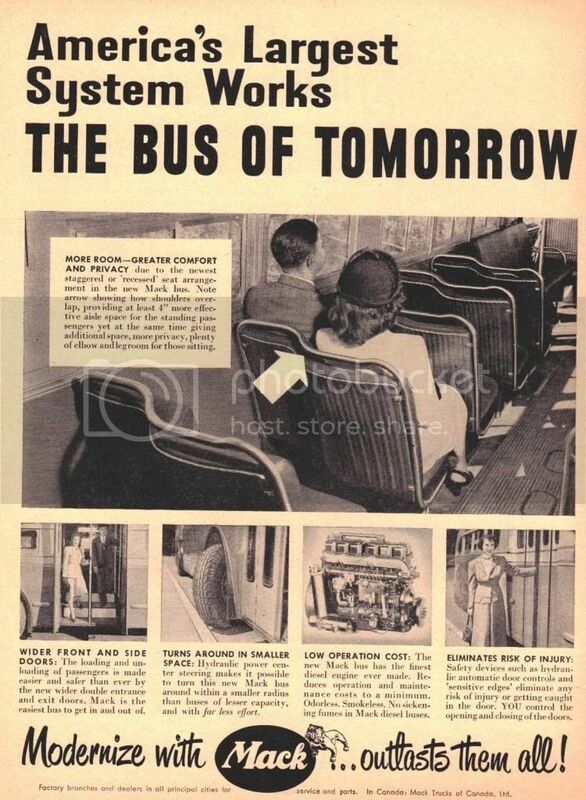 Originally the buses had handles between each standee window for bars to slide through to help prop the emergency cots. My theory regarding the staggered seats were simply to reinforce the strength of the seat backs to handle the weight of the cots. 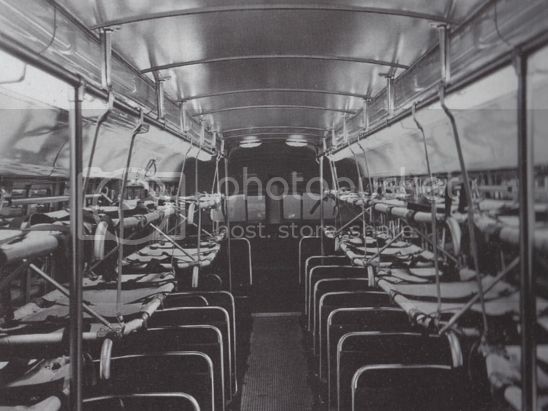 Photos courtesy of James Greller from his book "NYCTS Bus & Trolley Coach Fleet" and used for educational only. 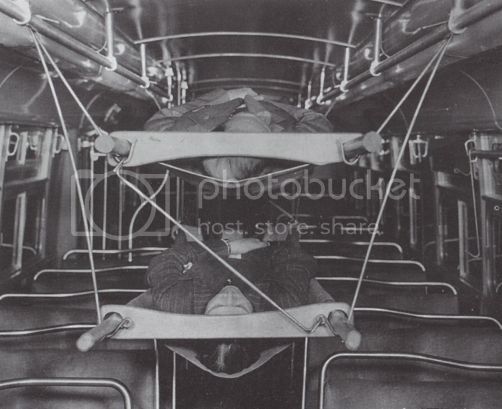 I've seen the stretcher configurations that you show in your first two pictures which are located suspended over the seats. 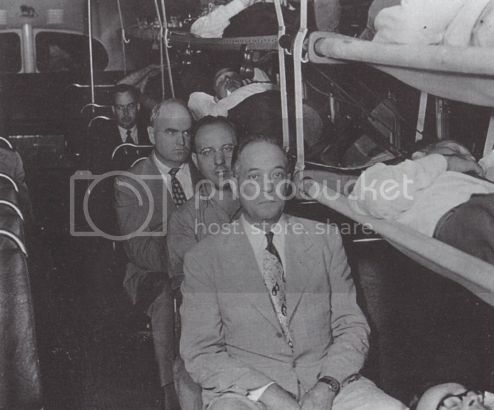 But the third photo in which they are hanging right down the center of the aisle makes little sense for nursing on the way to the hospital which would entail walking over the seats to do so. Great shots - thanks for sharing. Attached is a very clear interior close-up of the operations center of fleet # M64 - a 1955 Mack Model C-47-DT in what was apparently a very short lease as a demonstrator for the then Public Service Coordinated Transport of Newark, New Jersey. There is much to note here including a passenger crowd gate (which I have always referred to as a 'passenger compactor'), what seems to be a counting device over the left end of the windshield (undoubtedly, a PSCT attachment), destination scroll knobs but with no evident openings for the driver to see where he was scrolling to and what appears to be a massive stanchion that might have supported a fare box. Also of interest is Mack's unique placement of a motor housing in each corner over the windshield with their integral appendages to meet a full time fresh air mechanical ventilation mandate. Personally, I like the glass partition separating the driver from passengers that the GM's that I drove should also have had! 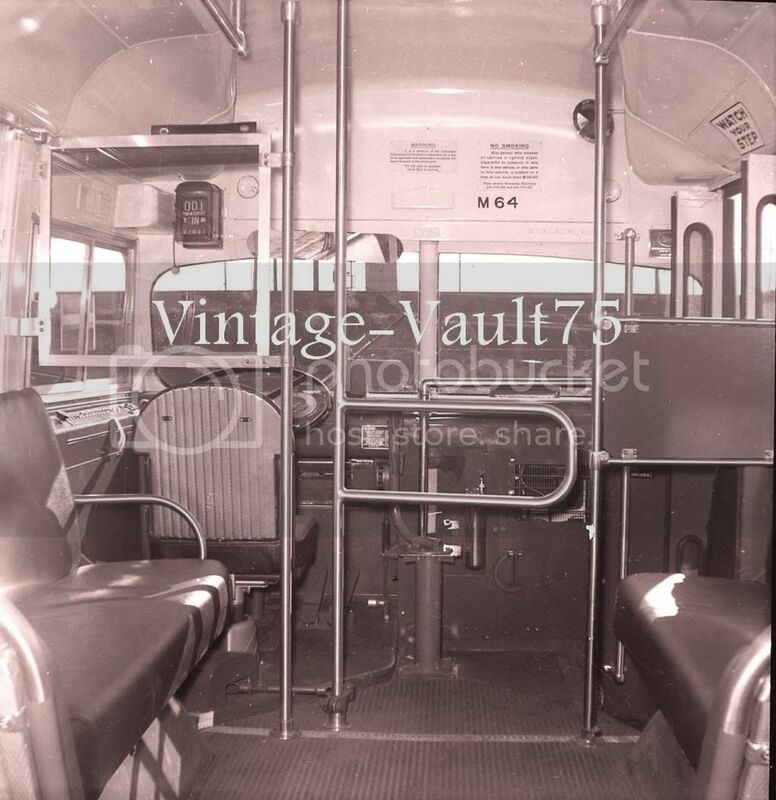 By 1956, # M64 was off to North Bergen, New Jersey to enjoy what, according to records, was to became a long term relationship with the Randolph Bus Company - an affiliate of the North Boulevard Transportation Company IBOA as fleet # B-137. Photo courtesy of 'Vintage-Vault75' and is available on eBay as item # 181150426409. Seen in 1935 at the factory in Kent, Ohio and readying for delivery is fleet# 146 - a 37 passenger Twin Coach Model 37-R and one of twenty five likenesses delivered to Trenton Transit Company of that capital city in New Jersey. Some have said that the 'R' designation in the model number meant 'revolutionary' while others favored 'rear engine' and, in truth, they were both correct because it was the first rear engine design from Twin and took form as a 126 hp Hercules RXCT mounted transversely and driving forward through a short right angled shaft to an off center differential gear (unfortunately, Austin's patented angle drive was not available to Twin at the time). While the 37-R was becoming quite popular with operators, the need for larger capacity buses soon trumped its sales and only 218 were built between 1934 and 1937. Of note on #146 are the New Jersey mandated passenger window safety bars and fresh air intakes over the destination sign to feed the full time mechanical ventilation system (no relation to the rather large intake over the rear windows for the engine). Also of note is the pointed front which was almost immediately flattened in production due to complaints that the protrusion wasted valuable garage storage space. In 1929, Trenton Street Railway was succeeded by Trenton Transit Co., and in 1959 by Capital Transit Co. Streetcars were discontinued in 1934. In 1969, Capital Transit Co. was acquired by the publicly owned Mercer County Metro, which continued to operate buses until 1984, when New Jersey Transit assumed operations. 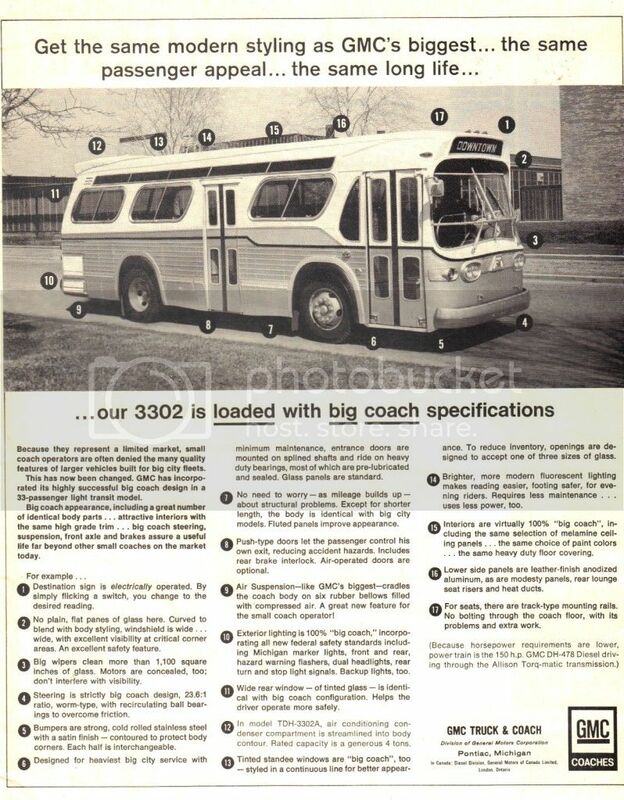 Photo courtesy of '4509bus' and is available at eBay as part of the entire June 1979 issue of Motor Coach Age (dedicated to Trenton Transit) under item # 370881018183. 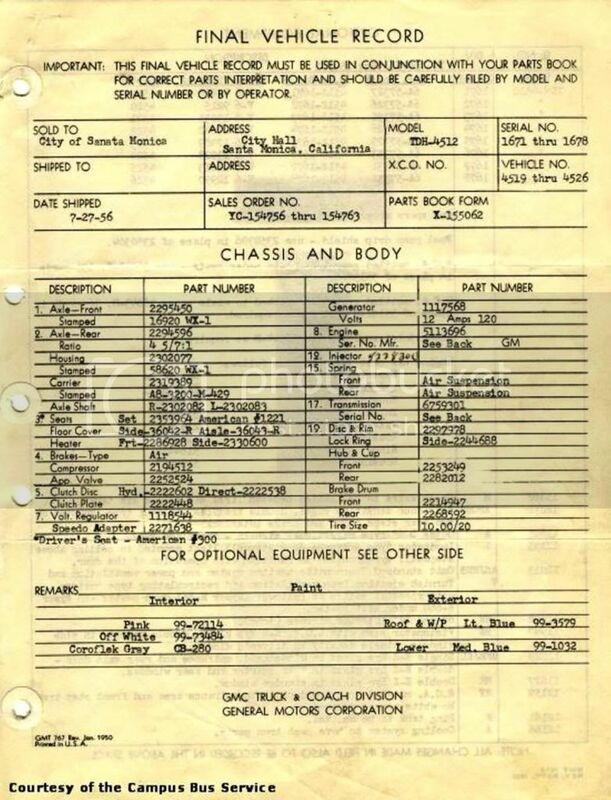 Thanks to Kent State University's Campus Bus Service (CBS) we have been furnished with extremely interesting reading below in the form of a 'Final Vehicle Record' on an order of eight GM TDH 4512's purchased by Santa Monica Municipal Bus Lines of Santa Monica, California. You really must read and absorb every line on both pages to appreciate what made these buses tick from a new viewpoint. 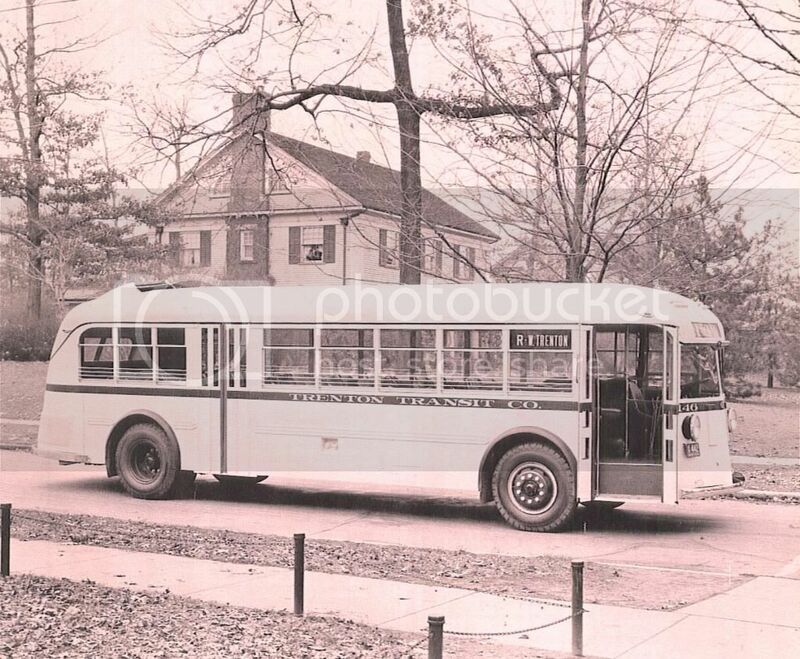 In 1967, Kent State decided that it was time to provide private bus service both on campus and around town to its students and faculty and thus began CBS with a fleet of fifteen pre owned TDH 4512's (eight from Santa Monica and seven from Green Bus Lines of New York. The service, operated by students as drivers and mechanics, was an immediate success and subsequent buses of various manufacturers were purchased new through the years. There are some tidbits of particular interest; did you know that GM's window glasses were known as 'Visionators' and that they were double density for passengers and only single for drivers? Also note that only one (1) spare wheel was provided for the entire order (if I'm reading it correctly!). I would consider this akin to window stickers on new cars at a dealership (sans the price listing). What I would really love to see is the ordering catalog (if they exist) for the same bus, listing all possible options available that makes an order unique for each bus company. Seen in images taken in 1948 in the environs of Jamestown, New York are fleet #'s 20 and 40 - both 1939 27 passenger Model 739 Yellow Coaches and two of four likenesses purchased used in 1947 by the Jamestown-Westfield & Northwestern Railroad Company of the far western New York city of Jamestown. A forerunner of Yellow's about to be introduced 'streamlined' transits (now known to us as Old Looks), the little heavy duty integral bodied model 739 featured the first use of separate standee glasses and derived its power from a 400 cubic inch gasoline truck engine by GM mounted transversely at the rear combined with a standard three speed mechanical transmission. The model was popular enough among operators both large and small to have seen 388 built between 1937 and 1941 with only a designation change to TG-2501 in 1940. 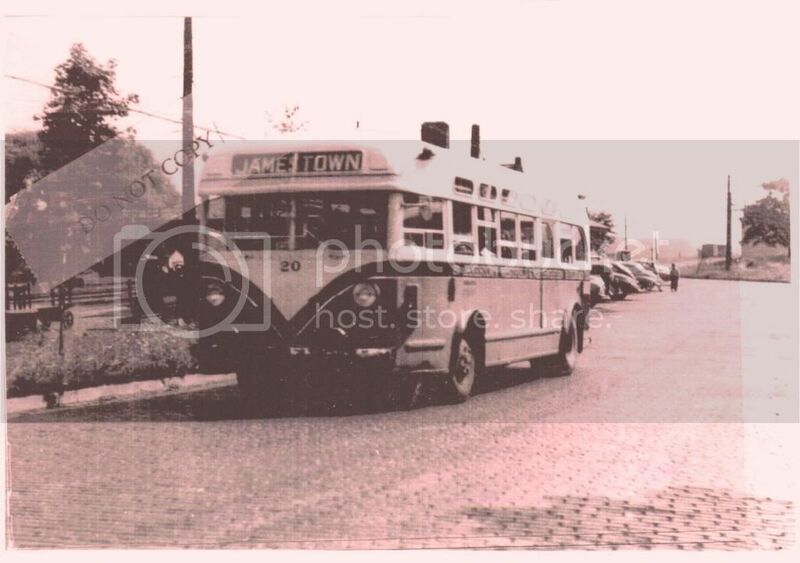 The four Jamestown buses replaced a 27 mile trolley line between that city and Westfield, New York and were themselves retired in 1950. 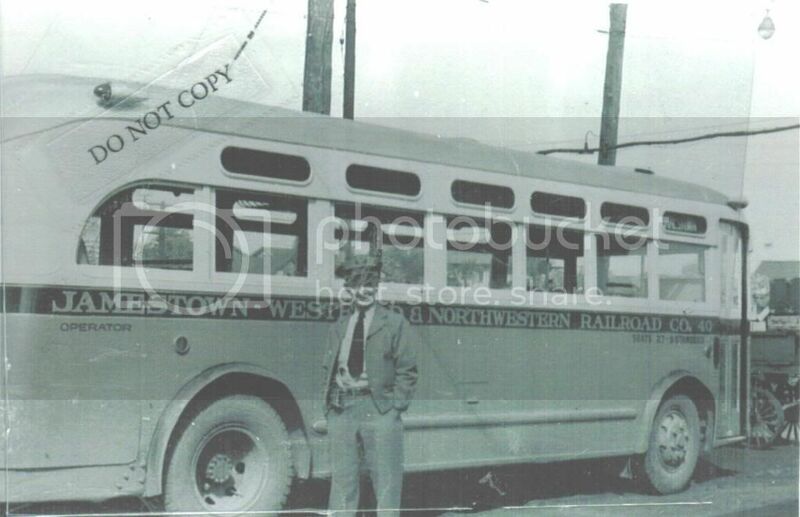 BTW; for the record, that's former trolley motorman Pee Wee Phelps (lower frame) proudly standing next to his new ride. Photos courtesy of 'wnyadman' and are available at eBay but used here for educational purposes only.